As a higher percentage of the global population lives longer, age related eye disorders such as glaucoma, diabetic retinopathy, cataracts and macular degeneration are on the rise. In addition, a host of modern lifestyle habits such as poor eating, overworking and the excessive use of visual displays, have created an environment rife with conditions such as dry eye syndrome and myopia. Although surgery is the only option for the treatment of certain ophthalmic conditions such as cataracts, ophthalmic drugs continue to account for the highest percentage of spending within the wider market for ophthalmic products. Expected to surpass $35 Billion in global spending by the end of 2020, ophthalmic drugs remain the preferred approach to treat common eye disorders, ranging from dry eye syndrome to more complicated conditions such as glaucoma and macular degeneration. Despite the loss of patent protection for several blockbuster drugs which has attracted generic competition, the market is ripe for future growth with a number of novel products in late-stage development. 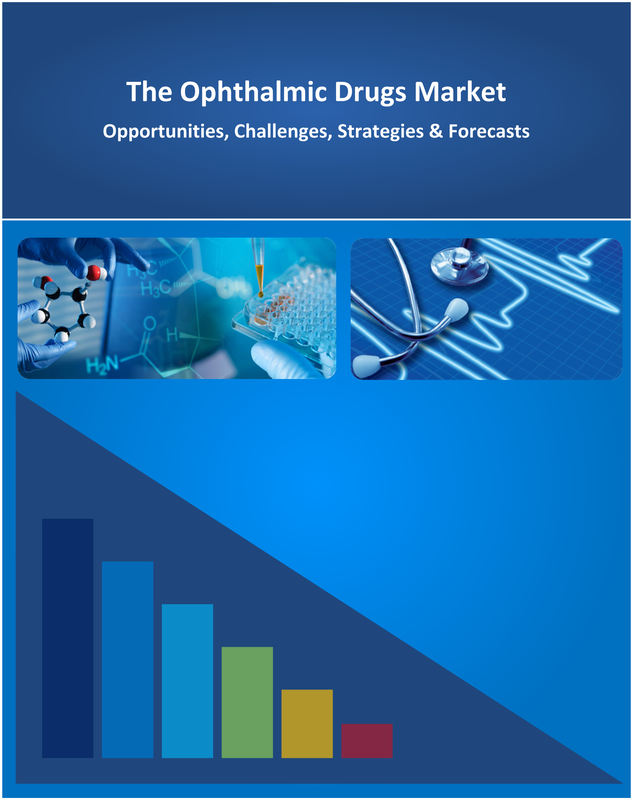 The “Ophthalmic Drugs Market: 2019 – 2030 – Opportunities, Challenges, Strategies & Forecasts” report presents an in-depth assessment of the ophthalmic drugs ecosystem including application areas, delivery technologies, key trends, market drivers, challenges, investment potential, leading therapies, drug development pipeline, opportunities, future roadmap, value chain, ecosystem player profiles and strategies. The report also presents market size forecasts for ophthalmic drugs from 2019 through to 2030. The forecasts are segmented for over 7 therapeutic categories, 5 regions and 25 leading countries. Expected to surpass $35 Billion in global spending by the end of 2020, ophthalmic drugs remain the preferred approach to treat common eye disorders, ranging from dry eye syndrome to more complicated conditions such as glaucoma and macular degeneration. Drug developers are continuing to invest heavily in drug development programs for eye disorders, primarily in the areas of AMD (Age-Related Macular Degeneration), diabetic eye disease, glaucoma, dry eye syndrome and uveitis. These indications collectively constitute more than 80% of all clinical development programs. Late-stage clinical development programs are primarily focused on long-acting VEGF inhibition for wet AMD, and other vascular retinal disorders; anti-integrin therapy for diabetic eye disease; anti-complement agents for dry AMD; novel ROCK & other protein kinase inhibitors, and prostaglandin EP2, EP3 & FP receptor agonists for glaucoma; RASP (Reactive Aldehyde Species), nicotinic acetylcholine and cardiolipin peroxidation inhibition for dry eye syndrome; as well as product candidates based on new formulations and delivery mechanisms for existing drugs. Several novel approaches to ophthalmic drug delivery are beginning to emerge – ranging from implants for the sustained release of medication over a period of months to precise micro-dosing technologies that alleviate the inefficiencies associated with the high doses delivered by conventional eye droppers. How big is the ophthalmic drugs opportunity? What will the market size be in 2025, and at what rate will it grow? What are the prospects of advanced drug delivery technologies for ophthalmology? How will next-generation anti-VEGF therapies, ROCK (Rho Kinase) inhibitors, anti-complement agents and other new drug classes impact the eye disorder treatment landscape? Who are the key market players, and what are their strategies? What strategies should ophthalmic drug developers adopt to remain competitive?